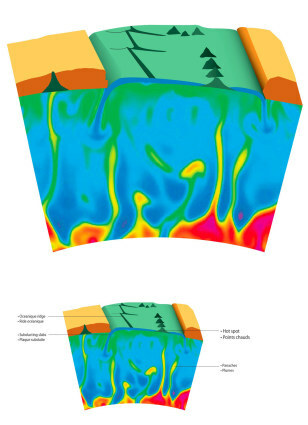 An illustration showing how a mantle plume can be emitted from the core-mantle boundary of the Earth to reach the Earth's crust. Due to the movement of tectonic plates at the Earth's surface, the mantle plumes can create a series of aligned hot spot volcanoes. A mid-ocean ridge and a subducted plate are also shown in this schematic from a study in the July 19 issue of the journal Nature.